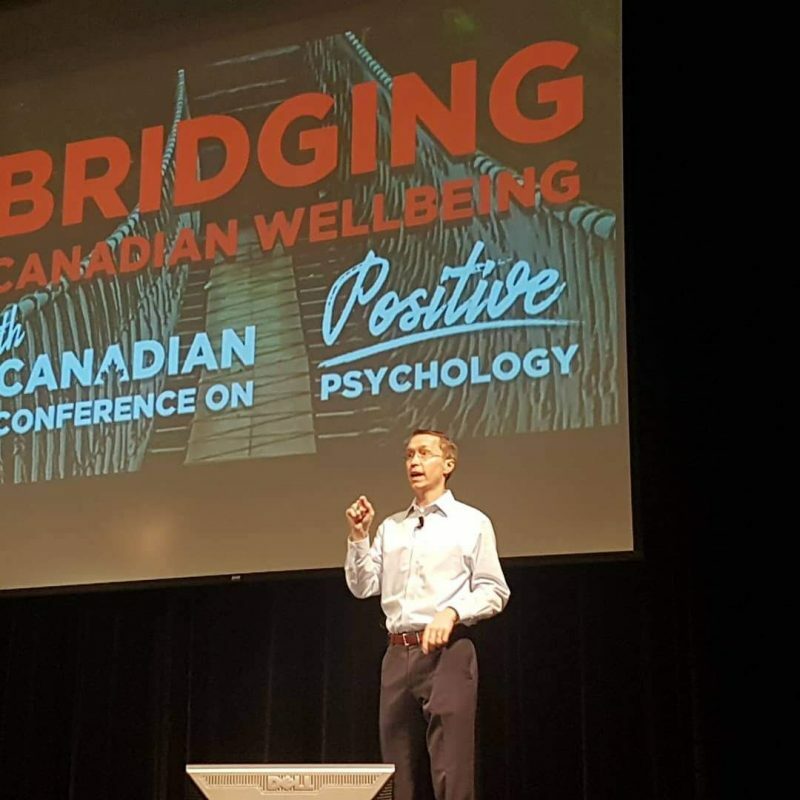 Last week, I was invited to present a workshop on Empathy’s Magic Power at the 2018 Conference of the Canadian Positive Psychology Association. 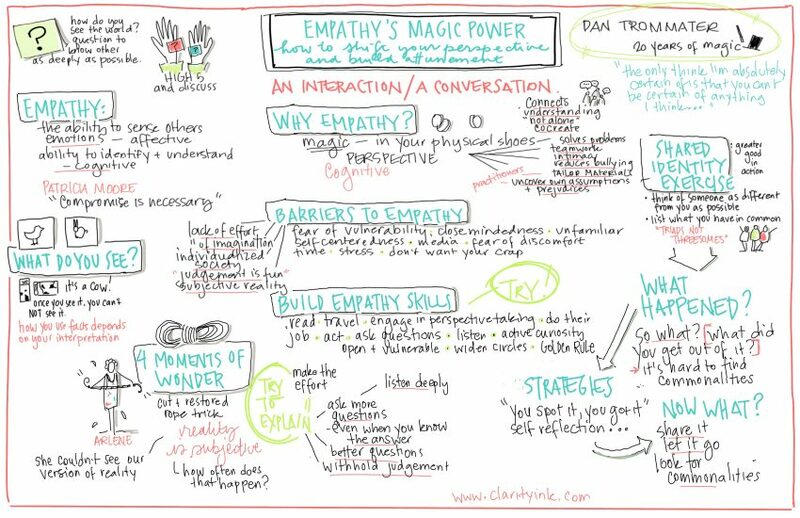 My session was a hit with the participants, (check out the beautiful Graphic Recording by Lori Danyluk of Clarity Ink!) and I was happy to attend the rest of the conference and learn a ton of great information. 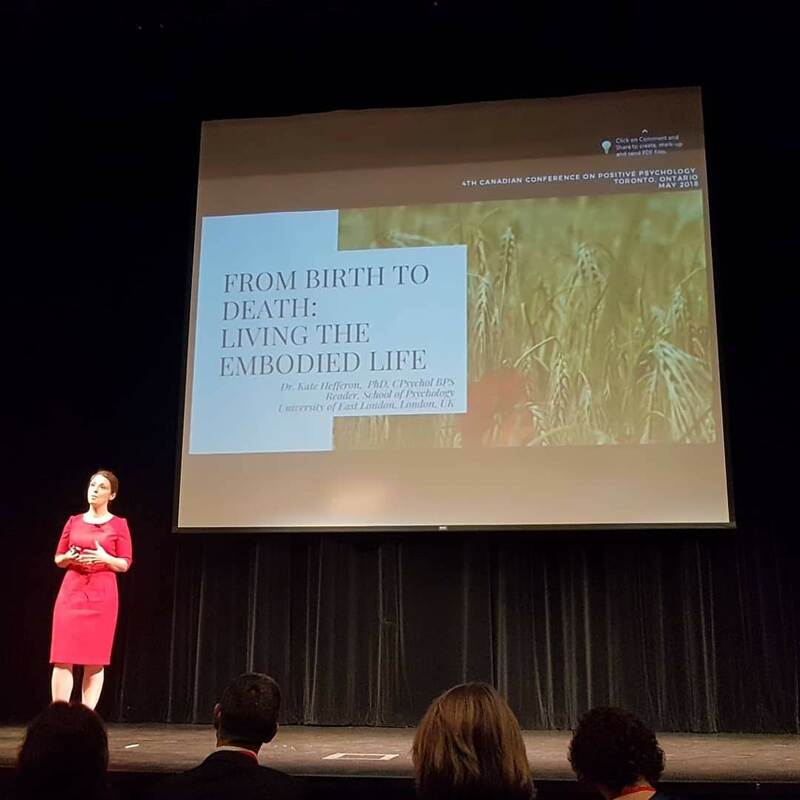 In her keynote address, ‘From Birth To Death: Living The Embodied Life,’ Dr. Kate Hefferon spoke about the critical role that our bodies play in the cultivation of a flourishing life. Our understanding of the mind/body connection is shifting. Research is showing that the body isn’t just a vehicle for the mind, it’s part of the mind. Become aware of your body – and don’t take it for granted. Celebrate your assets – focus your attention on what is working in your body and not what isn’t. Empower via activity – physical activity not only reduces the risk of physical illness, it reduces and buffers stress, anxiety, depression. Plus, by being active you increase your hedonic and eudaimonic wellbeing. Embrace finiteness – it’s a fact that our bodies deteriorate and die. That makes for an exhilarating reminder of how good it is to be alive. If you can engage in conscious, specific and personalized moments of mortality awareness, you can add zest and meaning to your life. Mark Groves’ session on Relational Wellness explored many aspects of creating healthy relationships, but the bit that stood out most for me was all about how the words you choose can change your perspective, especially when in conflict. 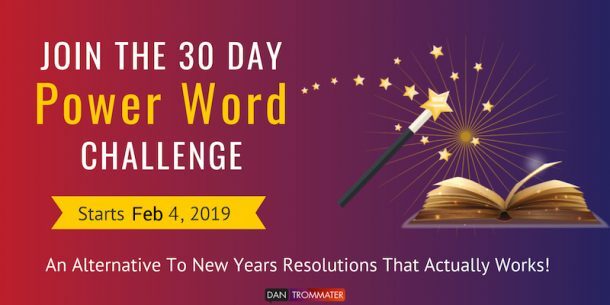 “I am angry” – when you use the verb am, you subconsciously imply (both to your partner and to yourself) that you and anger are one and the same. When you use this type of language, you tend to become more angry. After all, when you use this phrasing, you ARE anger. “Part of me feels angry” – this wording allows for other emotions to occur simultaneously. Sure, part of you may feel anger, but other parts of you could also feel vulnerable, love and fear. This nuanced form of communication helps convey your feelings much for effectively and can lead to better relationships. Of course, this isn’t all that surprising. It doesn’t take a PhD to know that if you want a good relationship, being kind and generous goes a long way. Still, it’s good to know that scientific research supports common sense! Next up on the main stage was Tom Rath, author of many books including StrengthsFinder 2.0, the top selling non fiction book of all time. Tom’s talk also focused on taking care of the body as a powerful positive psychology intervention and he emphasized the importance of sleep and walking. Haesun Moon is the Director of Training for Coaching Certificate Program at the University of Toronto. In her session, Confluence: How Hope Happens in a Dialog, she spoke about various conversational techniques to help people approach their challenges in the most useful and productive way. 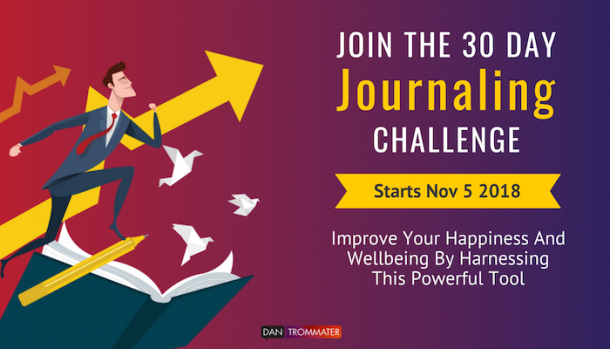 Much of the session was designed for therapists and coaches, but there was one brilliant idea that we all can use right away. Haesun used to hate going to weddings. She hated sitting at a table, surrounded by strangers engaged in small talk. She just couldn’t care less about the weather or how bad the traffic was getting to the venue. So, she decided to take control of the situation with one simple question – “So, what do you care about?” I’ve already tried it out and I can tell you that question opens the door to some really fascinating conversations! 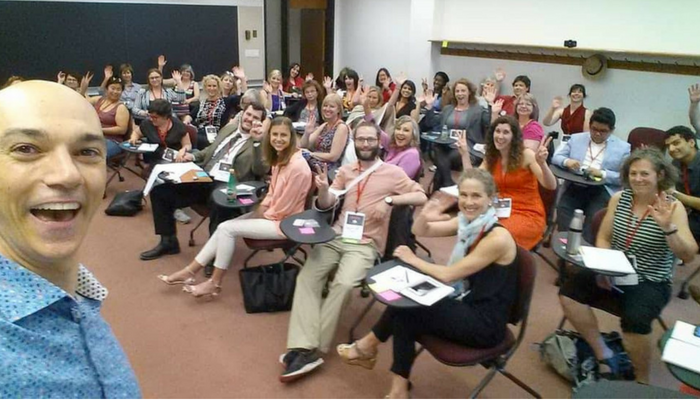 This quick recap only scratches the surface of what I learned at the conference. Still, even if you applied just a bit of what I learned to your own life, the results could be transformative. I challenge you to pick just one or two ideas and try them out in your own life to see what happens. As always, I’d love to hear from you, so comment below or drop me a line. I’m really glad you liked it Lori Nancy. I think you’d have loved attending the conference. Dan – I always open your emails!!! It’s like opening a great big present. Thank you so much for sharing these bits from the conference. I look forward to seeing more . . . . Thanks Diana! You’d have loved the conference. Maybe next time? This was a Positively wonderful review of the field and conference. Thank you for sharing, my kind and generous friend. Maybe we can go together next year! Loved your takeaways, so much to learn in life and every tidbit helps us become better at understanding ourselves and others in the process. Amazing what the sharing of knowledge can do for us all. Thanks Patty! I think you’d love the conference. Perhaps next year?